Holy CG orgasms! ALL ABOARD THE BATMAN HYPE TRAIN!! EPIC NERDGASM!!!! I so want to play this game. Especially on the next gen! I can only imagine the the sheer amount of content that will be in this game. Times like this bring tears to my eyes. Rocksteady if you was a woman I would lock you in a basement and keep you to myself. As you can see I am an avid Batman fanboy. 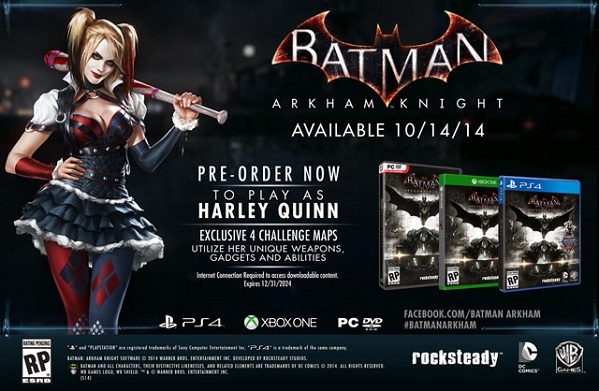 This game by the look of the trailer is taking a page right out of the New 52 Dark Knight Series. This game comes out for all next gen consoles. I am not sure if there will be a Wii-U version. We all know Nintendo ain’t doing to well right now. Developers running from that console like the plague. I can’t wait to see how the story unfolds for the Cape Crusader! So expect to see more info about this game on Carib Gamer! Also keep an eye out for the comic book reviews of the Batman! Mortal Kombat X Tournament LIVE!! !